It’s just as well that I never tried the yarn diet because I just don’t seem to have enough yarn! On Saturday Jeni and I went to Swansea for a Knitting and Crochet Guild meeting. On the way we stopped at Borders and picked up some knitting mags then on to Mrs Mac’s yarn store. We both bought ten balls each of some Noro Silk Garden in autumn shades, I bought a couple of balls of a blue/green/pink combination for a feather and fan scarf or something and Jeni also bought a skein of Noro Iro. While mine is still sitting in the craft room, Jeni has already used her her Iro to make a wonderful bag! The K&CG meeting was fun although I missed seeing Michele who’s been quite ill for a few weeks now. I hope that she feels better soon. I’m incredibly behind on emails, so if I owe you an email I’m sorry. I’ll try and get in touch by the end of the week. The black Lamb’s Pride (why is LP not available in the UK? 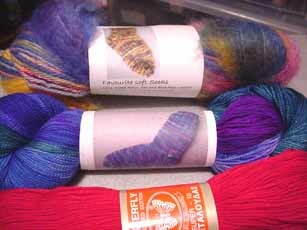 It’s ridiculous), Fleece Artist Soft Socks kit (blue, yellow and pink colour) and Deep Red Butterfly Super 10 cotton are from Village Yarns in Islington. Tip – before going to Village yarns ensure that you print off the directions from their website. Otherwise you may find yourself taking 40 minutes to get there when it’s only about ten or fifteen mins from the Islington subway stop! 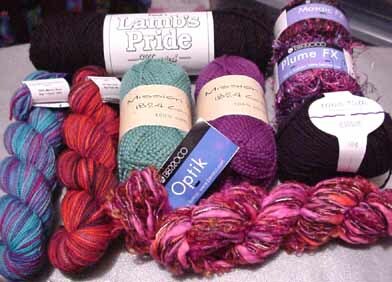 While not as large as Romni, Islington Yarns is still a big store and I liked their selection. They had the usual novelties as well as basics like Lamb’s pride. They seemed to have a good range of mid price yarns as well. The staff were friendly and helpful and also quite knowledgeable. Berocco Plume FX, Mosaic FX, Optik, Fleece Artist sock kit in blues and greens and silk yarn in black are from Romni Wools. Romini was the largest yarn store I’ve ever been in! I couldn’t believe just how big it was. It was chock full of yarns in fact novelty yarns are spilling all over the place when you walk inside. I did feel pretty overwhelmed by all of the yarn and it took me a while to get my bearings and decide what I wanted. I hadn’t intended to visit Romni wools because I’d heard that the staff were unfriendly, however once I saw it I had to go rude staff or not. I was actually pleasantly surprised because they seemed very helpful. It was the middle of the afternoon and they weren’t very busy so that may have made a difference. They had such a big selection that it was worth going in whatever. I saw Rowan, various sock yarns including Regia, Colinette and Noro on their shelves. Much more was there was well. The Koigu and Mission Falls cotton are from Lettuce Knit. Lettuce Knit is one of the newest yarn stores in Toronto and is in the fashionable Kensington Market area. It’s a small store but has some nice stuff. It was the only store out of the three to carry Koigu yarns and seemed quite light and friendly. 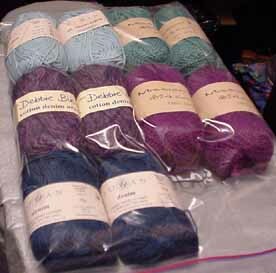 They also carry Noro, Mission Falls, some Rowan, Colinette and others that I can’t remember. I think that I’d visit all of these stores if I went back to Toronto. I do hope to visit again in a couple of years time. My friend Hannah holds a party every year to celebrate the Winter Solstice. A group of us get together and some of us exchange gifts. Last year my friend Heather gave us gifts of Moonsters. What is a Moonster? Well it’s a personalised ritual that you can do on the phases of the moon and how they affect you. I had to decide which type of moon I wanted to do my ritual on and provide Heather with some information about myself. I chose to have a new moon ritual and when it arrived I was little bid worried at first as to what it might contain. Maybe I had to do something that felt odd or weird. Well it was neither of those things. I had to walk slowly through the rooms of my home and decide what I wanted to do with them, decorate, put shelves up whatever came into my mind. The ritual was in several stages and included analysing my dreams. Usually I have to be in the mood for doing things like thinking of decorating, but who knows when that mood will come upon you? Well that’s sort of what the Moonsters do. They tell when it’s the right time to do something, when the energies are right for you. My last Moonster involved thinking of craft projects, well that might sound like a no-brainer (!) but I’ve felt full of ideas this month and the Moonster helped me tap into them. You can find out more about Moonsters by going to Heather’s website. This arrived for me today from the lovely Becky! It’s some fabulous Anny Blatt Merinos yarn! It is, shock!, DK weight! I’m slowly moving down the needle sizes! Thanks Becky! And if you want to see what I traded for this go here. I’ve been thinking a bit more about the Colinette poncho. It is basically two rectangles sewn together so I’m going to have a stab at making one without a pattern. I’ve made a little model from a post-it note and will use that for working out the measurements of the poncho. 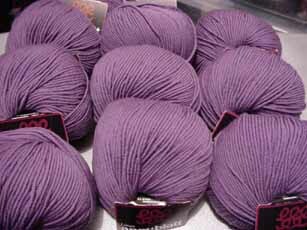 I have plenty of Colinette in my stash but I actually like the sound of some of Wendy’s not-Colinette yarn subsitutions. 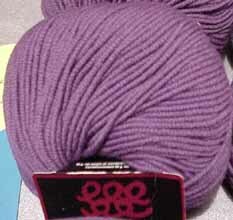 I’m thinking that I may have enough yarn to create a blue green poncho. Something else that’s still on my to-do list is a bucket hat. I haven’t got any further than casting on a few stitches in Black Rowan Handknit DK because I’m waiting for some new needles. When I get them they’ll get a lot of use because this is my Summer Bucket Hat stash so far! I’m not usually a poncho person but I’ve become quite taken with the Colinette ponchos that Wendy has been knitting. They’re from Colinette’s Vintage Knits kit which is discontinued in the UK according to the lovely people at Colinette. If anyone has a spare copy of the pattern that they’d be willing to swap for yarn or another Colinette pattern book – I have a few to swap – let me know. Oh and before you ask, I’m not one of those awful people who wrote to Wendy yesterday demanding a free copy of the Colinette pattern. Why do people do that? Have they no manners? Do they not understand copyright? Sadly, it’s probably all of the above. Another online knitting magazine! But this time it’s different, CHIAGU is aimed at the intermediate to advanced knitter. Can’t wait to see what it’s like!